We have a new style to add to the Made590 family, and one you’ll love in this colder season. She’s called Scarlet and she’s a skivvy with a modern day twist. With her lowered seams around the neck she’s not as constrictive as traditional turtle necks, making her the perfect piece to keep you warm, yet allowing movement in the neckline. We think this is a more chic alternative to traditional skivvies and turtle necks as it has a lovely, blousy element so you can team her back with your more dressier styles, too. She’s the perfect piece to wear layered with this seasons Made590 collection, but also easy to team back with your existing Made590 wardrobe – making her a versatile investment piece if you love your summer wardrobe so much that your want to see it through to Winter. 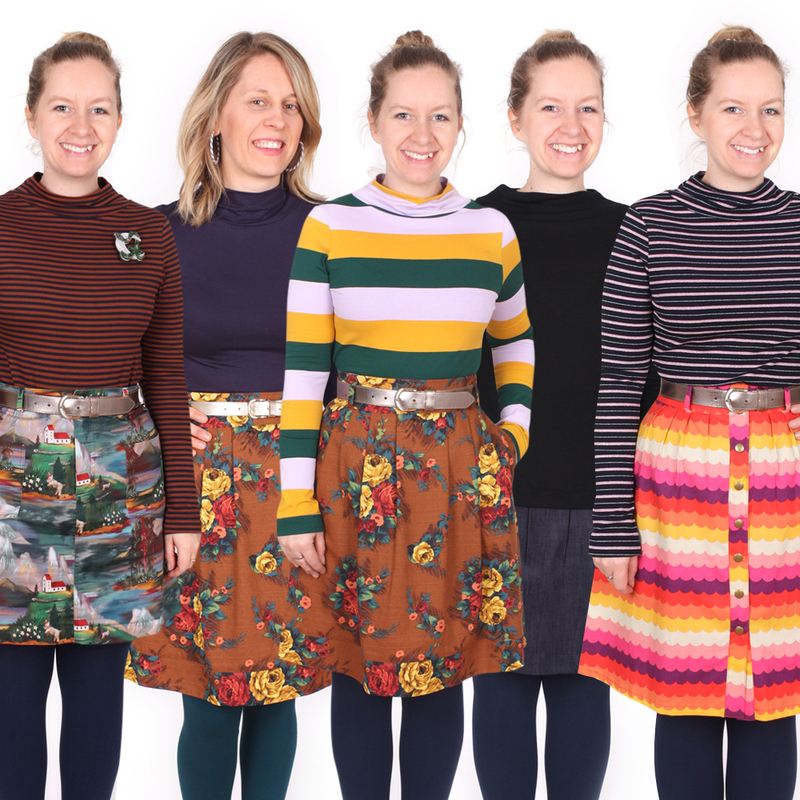 Wear underneath our Penelope tops, Indigo tops, Ginny tops – she also works perfectly with our Pinafore dresses – both a customer and staff favourite, our Jessie dresses, Penelope dresses, Nigella dresses and our Sadie Sweater dresses. Wear back with any of your favourite Made590 skirts – she looks especially mod with our newer, Petra skirt – the outfit is a bit of a nod to the 60’s. You can also wear back with your favorite pair of jeans or straight leg pant – we’ve designed her with enough room throughout the body so you don’t feel like she’s too clingy to wear on her if you’re not layering her and with enough length through the waist that she sits at a nice point, flattering your hips. She’s the perfect piece to wear if you don’t like wearing scarves or need that extra warmth without wanting to wear a scarf accessory. A higher neckline top like the Scarlet is also perfect for wearing with your favourite brooches! She’s instore + online now. Previous Previous post: Penelope Dresses galore! Next Next post: A rare opportunity to join our team has popped up and we want to hear from you!